“Are you and Andrea related in any way, shape or form?” Q’s beady eyes shone with curiosity. “Wait till I tell you,” Q said and then paused. Abimbola Dare started writing on her blog, www.bimbylads.blogspot.com in 2007. 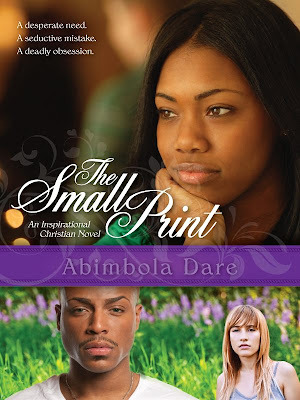 Following the birth of her daughter, she took a break from blogging and wrote the novel, The Small Print which will be released in November 2011. Abimbola Dare is currently on a blog tour and would love to visit your blog to share her story. Please contact her at www.facebook.com/bimbylads or at her website: www.abimboladare.com to read more sample chapters.